Do you ever feel like your work time is slipping through your fingers? That feeling you have at the end of the day, when there are still things to do but no time left to do them. There’s a simple solution to your problem: you make more time. 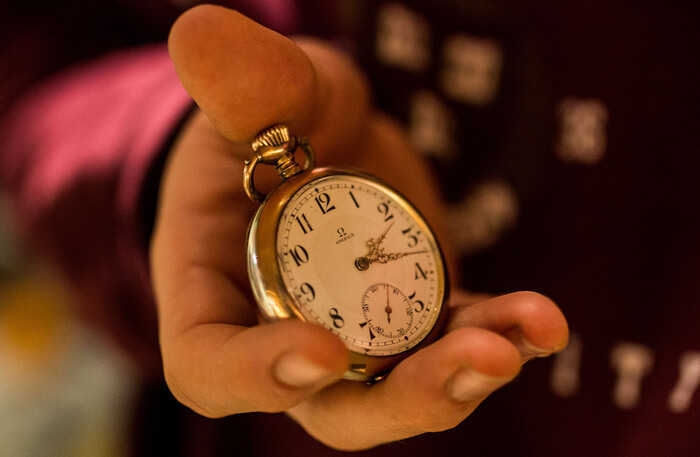 Unless you own a time machine, you will need to introduce a few time management tips and productivity methods to your work. In this case, the medicine is not even that bitter. It’s all about discipline and using tools that will help you keep it. What should be the measure of your success? See if you can squeeze an extra work day into your week without taking on more hours. Sounds impossible? It’s definitely a challenge (a huge one) but just wait and see how much time you can save and then decide if it’s doable. Don’t underestimate your self-control. You may yet surprise yourself. One of the first time management tips I’d like to share is not even about saving time. It’s about using the time you have wisely. Getting to work each day and doing a ton of different tasks isn’t that hard. Unless you are woking in a field that suffers longer periods of downtime, there’s usually always something to do. The important question is: are you making an impact with your work? Not all work tasks you perform are equal. Even though the tasks may take the same amount of time, there are those that make a bigger impact and those that are hardly noticeable. The time you can spend working is finite. You can’t simply add hours upon hours to your daily workload. Make sure this important time is used as efficiently as possible. Being busy is simple. For example, going through all your emails, organizing the files on your desktop or participating in various discussions within your company takes a lot of time and effort. But at the end of the day, does it make a difference? Being productive is harder. It takes a whole lot of practice and even more discipline. But once you get it, you will be able to use the time you have more efficiently. A the end of the day, you would have results a lot more impressive than just an empty Inbox or clean desktop. Ask yourself what’s the single, most important task you have. What will make the biggest impact? And then do it. Stop procrastinating and focus for a bit on what’s important. Once you deal with the biggest, baddest, game-changing tasks, you should spend your time on the more menial stuff. Even though your projects can look a bit hectic when working like this, they will move forward. And it’s infinitely better to have a project that is a bit rough around the edges but is growing than the best organized list of things you need to do to even get started. Getting the important tasks done first is definitely a step toward more efficient time management. However, it’s just the first step. The second step is making sure you stay productive. Staying productive is a lot like trying to balance something on your hand. It’s difficult to get it started and it only takes a second to lose your concentration. Would you like to get longer periods of productivity instead of just short bursts? To get them, you need to work on creating the optimal working conditions. If you have the comfort of working alone, you’re already ahead. If you work in an open space, it’s a bit harder but it’s definitely possible. You want to remove all distractions and allocate 100 percent of your time on the task at hand. A lot of buzz in the office? Try working in noise-cancelling headphones. People coming in and out of the room draw your attention? Sit in a place where you won’t see them. What you can take from this, even if you are not doing any writing work, is that you should remove all external distractions before starting to work. Everything that happens around you will distract you. For example, when I want to focus, I put my headphones and sit facing a wall so there are no distractions in my line of sight. Even my peripheral vision won’t pick up anything distracting. If you don’t like to work in total silence, there’s always music. If music distracts you, you can try white noise. It sounds silly, but some people find the sound of a vacuum cleaner or static really helpful at shutting everything else off and concentrate. Get rid of the things that distract you and you won’t have waste time on getting back into the working groove. If time management had its queen, it would be time tracking software. This is one of the more extreme steps you can take when trying to improve your productivity and time management. 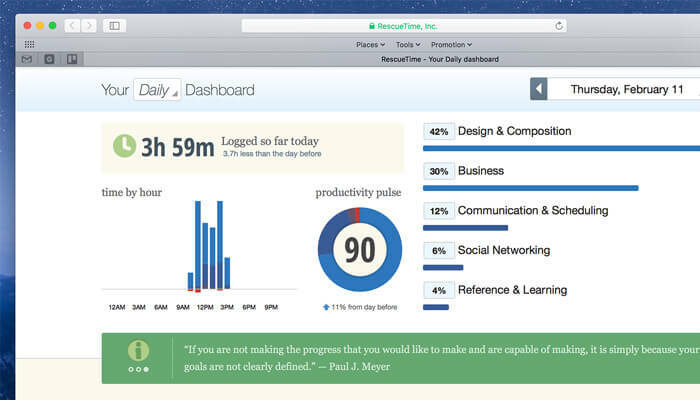 Time tracking software sees everything you do on a computer. Every page of every website, every application. Whenever you quickly jump on Facebook to reply to a friend, it’s recorded. At the end of the day, you might be surprised how much these short brakes cost you in terms of your work time. It’s both brutally honest and really good at telling how you are using your time. Or, more importantly, how you are wasting it. And once you know the diagnosis, you know where to apply the medicine. For each piece of software like this, there’s usually some initial set up required. For example, you may have to let your time management software know which activities are productive and which are not. For example, I discovered that I spend a lot of time writing or replying to emails. Even though I can’t really get rid of my email account, I was able to cut down on the email time and use that time for more productive things. In Rescue Time you can set certain goals you want to reach, for example 6 hours of only productive time each day. The app will tell you when the goal is reached and at the end of the week send you a neat report summarizing your work. Tracking all your activities may seem like going a bit too far. But if you really want to improve and learn proper time management habits what’s there to lose? One big leap of faith and a couple of weeks of time-tracking will do wonders for your productivity. You know what else I learned when I started tracking my time? You can lose hours of your time by simply going to a website like Facebook or Twitter now and then just to check if you don’t have any incoming messages. In general, the best option would be to leave your Facebook friends, that funny Pinterest board with cat pictures and all daily news websites at the door when you come to work. However, when you work online, the distractions are just a couple of keystrokes or a link away. All that muscle memory you’ve accumulated over years by accessing a website over and over (just see how quickly you can get on Facebook or Reddit) makes it really easy to slip. Before you know it, you can be reading your Facebook notifications or see what is happening in your city. To fight that kind of self sabotage, you can block these distracting websites while letting other go through. The easy way to do that is to use browser plugins like Block site. 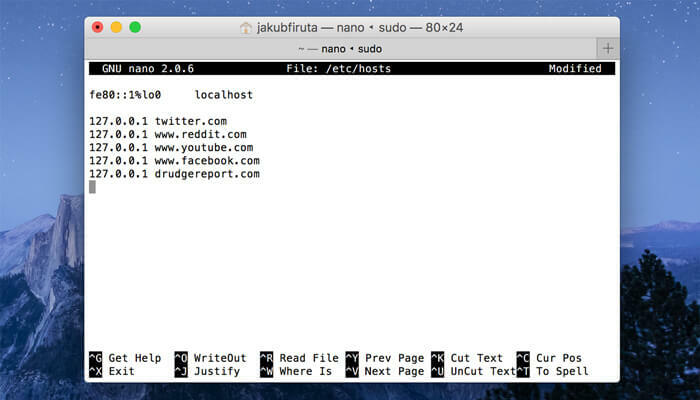 A bit harder alternative is blocking the websites using the command line. It probably sounds complicated but takes seconds once you get the hang of it. Here’s a step-by-step tutorial on what you need to do to block websites for Windows and Mac. After a while, you won’t even have to block these websites. You will learn to go about your day without having to check Facebook every 10 minutes for updates. Your work flow only stands to gain when your browsing discipline kicks in. See for yourself how much time you can save using these time management tips. It won’t cost you anything. All you need is the discipline, but that will come with, well, time. Focus on the important tasks – Often you won’t need to get more time but simply make the most of the time you already have. Get the important tasks done first, leave the menial tasks for later. Organize your work environment – Time management is a lot about removing distractions that mess up with your productive time. Make sure you have a place when you can shut out the outside and focus on your work. Use time tracking software – Measuring how much time you spend on different activities will help you to spot any inefficiencies and cut down on the unproductive activities. Train browser discipline – Don’t let your productive, important time be wasted on bad habits. If you tend to waste a lot of time on distracting websites, block them when you are working. Give these a try an see how much time they can save you. Even if you don’t brake the one-day-extra barrier, it’s definitely a good start. Make sure to tune in for part II when we’ll be discussing even more time management methods, including making technology work for you instead of against you, starting your day with the most difficult tasks and a few words about to-do lists. Feel free to share any time management tips of your own in the comments! Photo courtesy of Sebastian Appelt via Creative Commons.